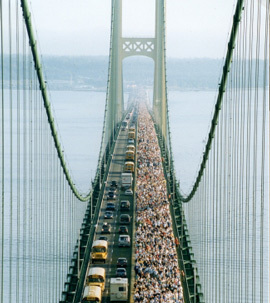 The Mackinac Bridge in Michigan is opened to walkers every Labor Day. Labor Day is the first Monday in September and honors America’s workers. Peter McGuire, a carpenter from New York, fought for many years to gain a shorter workday and higher pay for New York’s workers. In 1872, McGuire and over 100,000 workers participated in a strike that influenced future working conditions and pay around the country. Eventually, thousands of America’s workers joined unions and gained an eight-hour workday and more job security. McGuire and other workers organized the first Labor Day parade on September 5th, 1882 in order to recognize America’s laborers. Over 10,000 workers marched in the parade and celebrated afterwards with food and fireworks. Today, many communities hold parades, picnics, and store sales on Labor Day. For many Americans, Labor Day marks the end of the summer season, so beaches and parks are usually crowded over this three-day weekend. Some politicians begin their political campaigns on Labor Day with public appearances and speeches. For students, Labor Day signals the beginning of a new school year.